Purchase a Treviso Tailor Dummy - The economical Tailor Dummy for displaying clothes. The Treviso Tailor Dummies are produced in Italy and are available in both Male, Female and Children with different types of stand and body length. 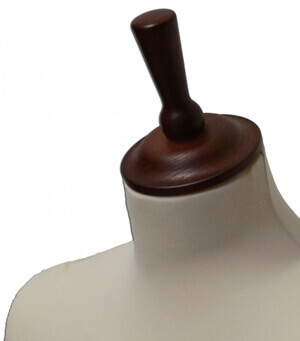 All Treviso Tailor Dummies comes is with a beige cover, but it is possible to buy a black cover. The children tailor dummies are available in a range of age groups and all comes with a round wooden stand and with a mathcing neck shaker. Our treviso tailor dummies are available with a long or short body. A tailor dummy with a long body are ideal for displaying dresses, while a tailor dummy with a short body is designed for displaying pant and similar garments. The dummies are available with a round or tripod stand with matching neck shakers. Are also available with a round chrome stand and shaker. The male tailor dummies can be purchased with a long or short body.